Eric VanRaepenbusch, Author-Illustrator, Storyteller, Blogger: Battle Boos from Center Elementary School! Thank you! Battle Boos from Center Elementary School! Thank you! Check out these awesome Battle Boos created by students at Center Elementary School! Space Bot, Speeddee Boo Bot, Cat Battle Boo, and Spiker Boo (clockwise starting in upper left). Space Bot is flying by the Little Dipper, a rocket, and a moon. Speedee looks very fast! I love that Cat Battle Boo has a #10 as an earring! Spikerboo would make a great #30 in Series 3 (It shouts, "SPIKED!"). 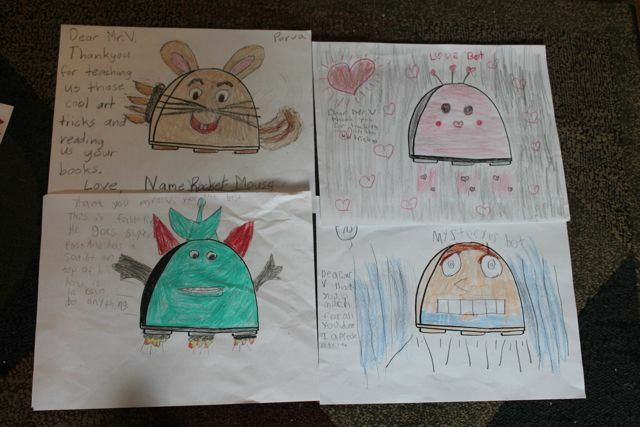 Rocket Mouse, Love Bot, Mysterious Bot, and Fasto Five (clockwise starting in upper left). How cool is Rocket Mouse! It looks like Love Bot showers hearts down as it flies around. The eyes on Mysterious Bot are very mysterious indeed! Fasto Five has a satellite on top of its head! 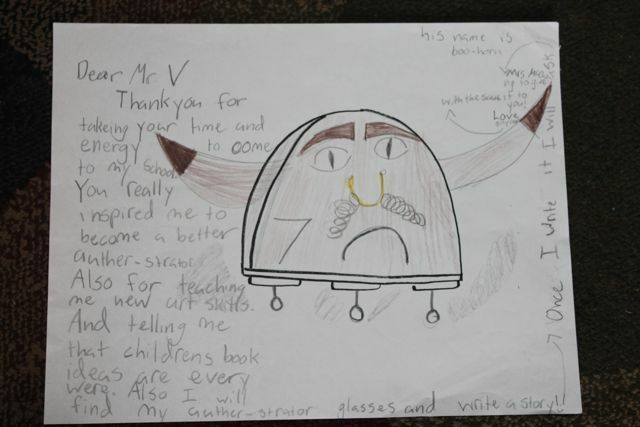 "Dear Mr. V, Thank you for taking your time and energy to come to my school. You really inspired me to become an author-strator. Also, for teaching me new art skills. And telling me that children's book ideas are everywhere. Also, I will find my author-strator glasses and write a story!" Spidekes, Rainbow VV, Zero Zoomer, and Fireshooter. (clockwise starting in upper left). The flames coming out of Spidekes are intense! The note from the student who created Rainbow VV states, "You've inspired me to make a book. It is called Awesome Sauce." 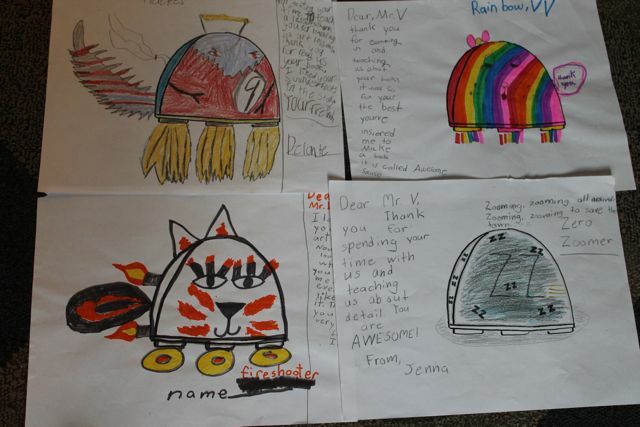 Well, I think Rainbow VV is "awesome sauce" and I can't wait to read your story! Zero Zoomer has its own theme song -- "Zooming, Zooming all around. Zooming Zooming to the save the town!" It looks like Fireshooter shoots flames out of its eyes! Whoa! There were so many more Battle Boos too! I loved each and every one. Thank you so much! 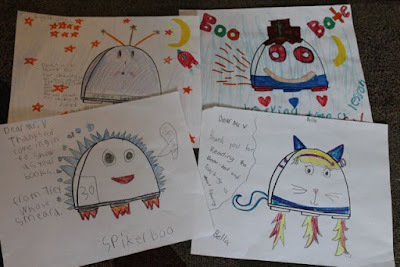 Do you want to make your own Battle Boos? Download the FREE printable!